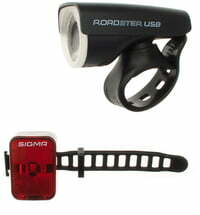 SIGMA SPORT's inception began in 1981 with the idea to produce a cycle speedometer - today's cycle computer - incorporating many advantages over the conventional tachometers. Ultimately, the vision evolved into offering good products at a reasonable price, along with the optimum sales tools for the trade. SIGMA SPORT represents German technology at its highest level, combining innovative design with precision engineering. It tests all of its products in the in-house laboratories to withstand the harshest conditions, ensuring quality continually through the production. All SIGMA SPORT standard lights conform to the stringent German traffic standard and all SIGMA SPORT products are CE-approved. No SIGMA SPORT product is shipped until it passes its thorough inspection. As a SIGMA SPORT customer, your confidence and trust is a key component to the success. SIGMA SPORT stands for innovative high performance and quality products at great value. The company believes it is important to be seen as a fair, friendly and competent partner at all levels. As a young and dynamic company, it is proud of the enthusiastic employees, and its uncomplicated and straightforward way of interacting with one another. The company seeks advantages arising from changes in markets, science and society and use these as an opportunity for value-enhancing growth. SIGMA SPORT develops and optimises the products and services, together with the customers. These products will always incorporate leading technologies- a proven, winning strategy in the sport and fitness categories in which SIGMA SPORT products are increasingly being distributed.